This is the icing that most beginner and professional cake decorators use for cake filling, exterior covering, and piped decorations. The most simple recipes are creamed butter or shortening and confectioner's sugar with various flavorings or coloring. You can also purchase premade buttercream at most supermarkets or decorating stores. Some popular buttercream flavors can include chocolate, peppermint, lemon, coconut, coffee, and even rum or brandy.Take care when using extracts in your buttercream because some can tint the icing an undesirable color. Simple buttercream will form a crust due to its high sugar content but is lovely and soft on the inside. This simple variation of the icing can be made in several different consistencies depending on the amount of sugar used by the designer. It is quite sweet to the palate but smooth and creamy if it is beaten correctly. Thinned icing is often used to crumb coat cakes with great success. Softer icing can be perfect for borders and swirling decorations, and stiffer icing is wonderful for flowers or piped leaves.You can make a large batch of this type of icing because it will keep very well in the refrigerator for up to six weeks if it is well covered. Cakes covered with buttercream can be kept for several days at room temperature but warm humid weather can create a melted mess. You also have to be careful when refrigerating buttercream decorated cakes because cold can cause condensation on the crusted icing and any colors may run. Make sure your butter or shortening is at room temperature before beating it. All the lumps should be completely beaten out before adding the sugar a little at a time or it will be impossible to get a smooth consistency. Try not to overbeat the buttercream after all the ingredients have been added or you might add bubbles, which will ruin the texture of the icing. 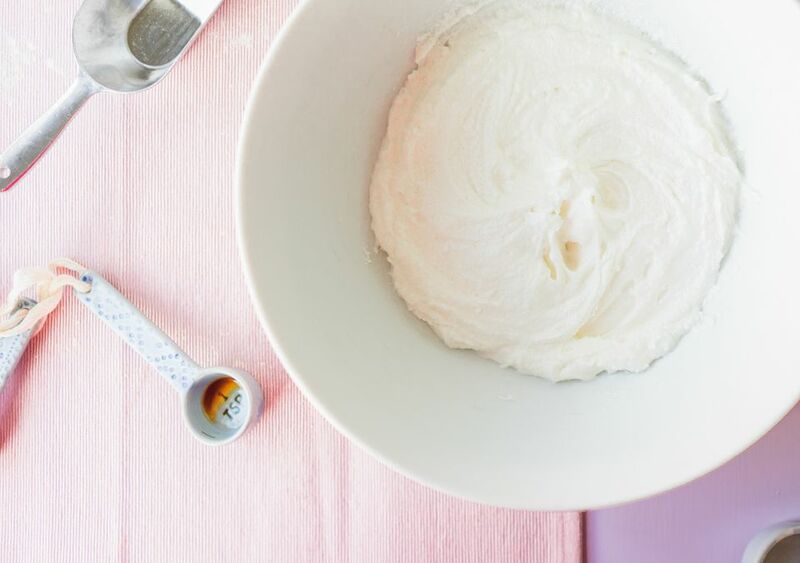 If you are trying to create a snowy white buttercream, you have to use shortening and clear flavorings. Butter and pure brown vanilla extract will create a pale ivory icing instead of white. Do not try and cover a freshly baked cake with chilled buttercream or it will simply fall to pieces. For the best results chill your cake and bring the icing to room temperature. You can also beat the buttercream for a few minutes to create great fluffy texture. If you are making dark colored buttercream icing such as purple or red it is important to allow the icing to sit for at least 3 to 4 hours before using it because the colors often deepen over time. After you have decorated your cake it is too late to adjust a deeper hued flower. You can use salted butter in a simple buttercream recipe for added taste.It combines beautifully with vanilla flavoring. Pretty pastel colors can be created with powdered coloring rather than liquid or gel. Sometimes, too much liquid coloring can completely ruin the texture of the buttercream, so try to balance the flavoring extracts and liquid coloring if that is the recipe you are using. Try to use professional quality shortening if you are not using butter for your icing. It produces a lovely icing that does not have a greasy texture or mouthfeel. Standard vegetable shortening is not ideal for the best results. What's the Difference Between Marzipan and Almond Paste?